June 2016 Horoscope for Aquarius foretells that domestic concerns and emotional aspects of your life will be dominant during the month. Your profession and business will not be a priority at the moment. In June 2016, independence and aggression will be replaced by social collaboration and conciliation. Aquarians have to be persistent and should not be affected by the consequent delays in life. You should focus only on vital issues. The Aquarius 2016 June monthly predictions foretell that professionally you should be ready to face changes in your job profile. The office environment will be highly volatile. Differences with partners are bound to happen. Aquarius, your financial planets Neptune and Uranus will not be benevolent this month. Earnings will come down temporarily. You can use this period for reviewing your monetary plans and for making necessary changes. You can channelize your efforts for creative activities which will yield profits in the long run. In June 2016, thorough examination of investments and large purchases is necessary to avoid financial losses. All risky ventures should be held back by the Aquarius zodiac sign. You should employ your imaginative and intuitive capabilities to make money. 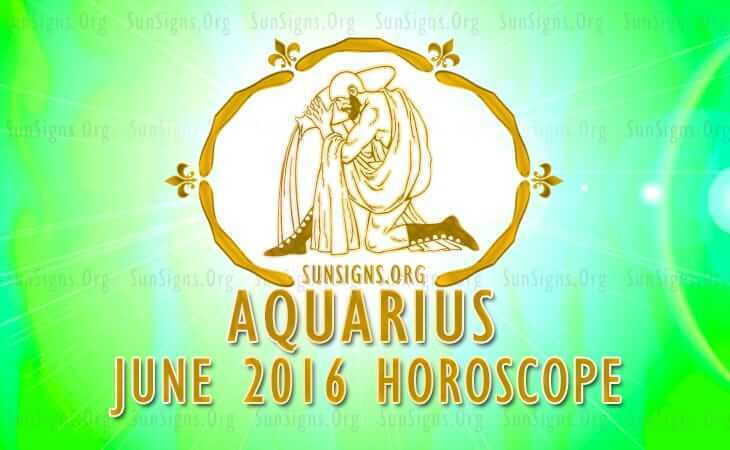 June 2016 will be socially vigorous for the Aquarians. Your social activities will reach their highs. Influence of Mars will override the effects of Saturn in matters of love. Prudence and sluggishness will give place to sexuality, boldness and rashness. Love will be energetic and you will find love mates almost everywhere. Social parties, educational environment, place of work, or gyms and fitness centres will provide you with romantic opportunities. Relationships will be for enjoyment till the 21st June and after that chances of committed partnerships will emerge. Married Aquarius couples will start thinking about having a child in June 2016. The Aquarius astrological forecasts for June 2016 predict that you have to be careful about your health during the month. You are serious about exercise, nutrition and alternate healing and these will help you to maintain your well-being. Sexual relationship with your spouse will boost your physical health. The 2016 June Aquarius horoscope predicts that love is in the air this month and new relationships will blossom.